Firstly, I need to say that I love to read and I love technology. So isn’t an e-reader the perfect combination of both? Isn’t it the perfect compromise between the small screen of an iPhone or iPod Touch and the chunky format of a regular book? In my opinion, yes! I believe that in the future the e-reader will be as popular as the MP3-player nowadays. However, I don’t believe that books will be someday completely replaced by e-books. There will be always nostalgic people who like to listen to their vinyl records, prefer their Walkman with self-recorded audiotapes or play video games on an Atari game console. But that is not the point. I think that we need to reconsider the linear reading of textbooks and to look forward to interactive (digital) books that include video and audio files, interactive diagrams or charts, etc. E-readers or e-book devices can offer this, especially in an educational context. We must understand that students read a textbook differently from how they read novels or nonfiction books. Most students, no matter which age they are, skim through the chapters, look at the graphics, charts, diagrams and sometimes they don’t even read the pure text. So in short, students don’t read textbooks linear. That means that we definitely need to find new ways to present educational content to the students. Luckily, a few companies made an effort to change textbooks into bite-sized, illustrated, interactive pieces of media. For example ‘Inkling’ by Matt MacInnis. 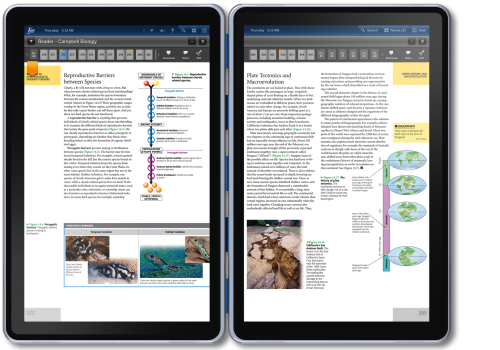 This is an iPad application that allows readers to jump into any chapter, to make notes while you are reading, to share your notes with other people, to highlight text, etc. In their words: “Inkling brings the world’s best content to iPad with interactivity, social collaboration and simple ease-of-use. No more heavy, expensive textbooks to carry around campus. Inkling textbooks are more interactive, more flexible and cheaper.”. Inkling titles are indeed less expensive than the paper versions, because you are able to buy them by the chapter. Moreover, the list of titles continues to grow every semester. But the problem is that it is unclear how many books are available until now. That means, that it will still take time to have a large library of e-books to choose from. Though, it is a step to the right direction. Another iPad application which could work as a trendsetter for other book authors is ‘The Elements’ by Theodore Gray. Gray made an interactive e-book (video) which is a real must have if you are in any way intrigued by chemistry and the way our planet and the universe is made. It is a graphically pretty table of the elements, telling you virtually all you need to know about different elements like Helium, Oxygen and others; such as those without a final name yet. Another plus is, that it directly links to Wolfram Alpha – another must for people who are interested in science. Unfortunately, this app is quite pricey for students (still cheaper than the paper version) and it takes 2 GB of the iPad storage. The last iPad application that I can recommend is ‘3D Brain’ by Cold Spring Harbor Laboratory. This app shows you “how each brain region functions, what happens when it is injured, and how it is involved in mental illness. Each detailed structure comes with information on functions, disorders, brain damage, case studies, and links to modern research”. I really like the structure of this app, because it is classified into the different parts of the brain and not into different chapters, as you can find in every book. This structure is more intuitive than the normal chapter structure which is sometimes not logically. And everything for free. Until now I only gave examples for the iPad but there are more e-readers to use in education. 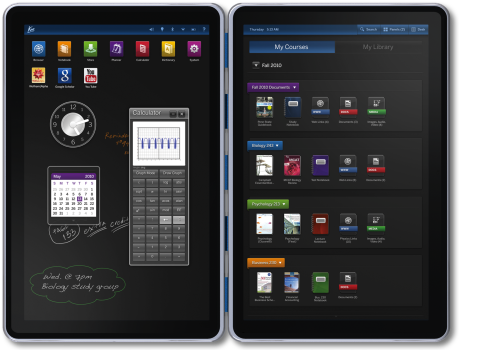 One recently announced tablet is Kno, which is specifically designed for students. The software system is expected to work not only on Kno’s tablets, but also on PCs, iPads and other devices. So they hope to do something similar than the iPad but without the distracting entertainment applications and with software that enables the student to interact with the textbook. Unfortunately, the makers of Kno haven’t said when exactly the tablet will hit the market and how much it will cost. The company plans to ship the tablet by the end of the year and the dual-screen version was expected to cost “under a $1000.” And here starts the problem with this e-reader. At first, I was kind of amazed that a company makes devices that targeted exclusively students. But which student or parent can afford an e-reader for, let’s say $800? So seriously, who pays $800 for a device on which you can only read textbooks, make notes and so on; this price even doesn’t include the costs of the textbooks? It would be even cheaper to buy a Kindle, an iPad and a textbook together ($500 iPad + $139 Kindle + $100 textbook = $739). That doesn’t sound like a student-friendly e-reader. This is just cupidity for money. The conclusion of this blog post is, that e-readers and e-books can offer an interesting educational contribution because the interactivity of these devices can support the different learning styles of students. But as long as the price of an e-reader won’t drop, a lot of students, parents and educational institutions will hesitate to buy such devices. Technology and the knowledge about it is not a problem. 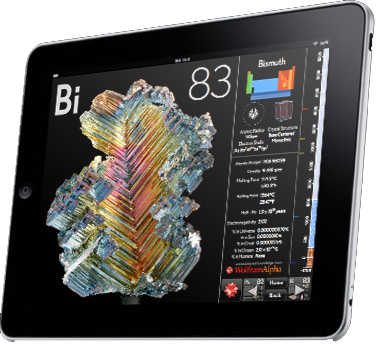 It is nowadays possible to build tablets for interactive textbooks. The real struggle is to make textbooks interactive. I mean ‘rich textbooks’ not just e-books; digital books with packaged content like videos, quizzes, and other interactive content. It would be even better, if we can build a standard format like PDF or MP3 that could work on every e-reader, no matter of the brand. But as long as this is not the case, e-readers are expensive devices that need their own software and their own book formats. And this is simply not affordable for educational institutions or students. Unfortunately! http://ipad4edu.com/ – A place to ask questions about using the iPad in education. E-readers, will they substitute educators and librarians?